We fulfill dreams of personal freedom – it’s our purpose, and we take it seriously. And while freedom means different things to different people, it’s a bond that brings Harley-Davidson® customers, employees, and enthusiasts together. 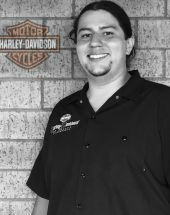 Meet the Team at Harley-Davidson®of Dallas. 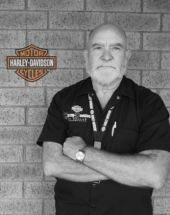 Paul has been working in the Motorcycle Industry for decades with a history and passion for racing. 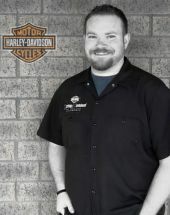 In 2010 he found himself in a position to join the Harley-Davidson Family with his own dealership and jumped at the opportunity without a moment’s hesitation. Driven by the brand’s extensive legacy and his personal attachment to the lifestyle, he knew he would be happy with a career focused on Making Dreams Come True. He rides a diverse line of motorcycles but one of his favorites is his 2013 Road King. It’s a New School ride in Old School style with 16 Gangster Apes, Fishtail Exhaust, and Slammed/Spoked Wheels. Ann comes to us from northern Montana. She moved to Texas to watch her new grandson grow up. Growing up as the youngest of 10 kids Ann is familiar with the diverse environment, team work, and dedication. In her free time she volunteers at a local animal shelter, reads books, and walks her sweet dog Betty White. 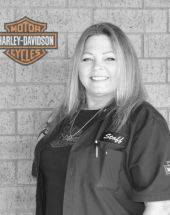 Prior to joining our team she was an office manager at 2 car dealerships and is looking forward to a new experience with us at Harley-Davidson. Amanda loves her family and is an avid reader. 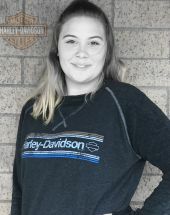 She spends her days at the dealership learning everything she can about Harley-Davidson® so she can educate the public on all the new and exciting changes! 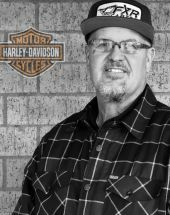 It was time for Tony to leave the corporate world and trade in his PC for a HD motorcycle in Feb 2017. 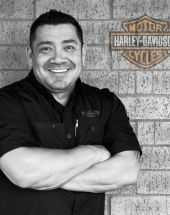 Tony went from being a business and IT management consultant to a Business Operations Liaison where he participates in many aspects of the HD of Dallas world. 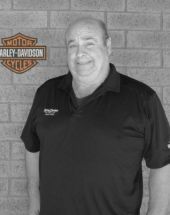 He handles the IT problems, assists with marketing, helps the sales team, and performs “walk-arounds” to explain the features and functions of the customers motorcycle. Bottom-line: he orchestrates the resolution of problems! 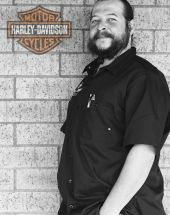 A North Dallas native with a Technical Degree in Motorcycle Mechanics, Tyler is a 20 year veteran rider on his '09 Softail Springer. 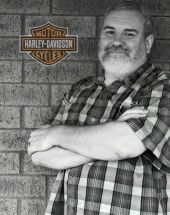 Specializing in Finance and Web Sales, he is an integral part of our H-D of Dallas team. When he’s off work he’s soaking up time with his wife and girls, getting road time in, working on his Frisbee golf swing, or critiquing someone else’s while watching ESPN. 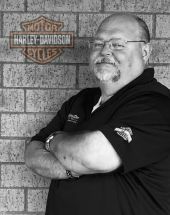 Darrel not only specializes in Harley-Davidson motorcycles, but also Information Technology. He is not just a Motocross enthusiast, but this native Texas is a competitive rider. 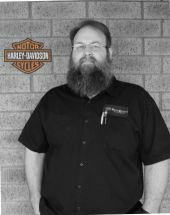 Darrel will help you get fitted for the perfect Harley-Davidson motorcycle - make sure you talk with him on your next visit to the shop. Jeff recently relocated to Texas to be closer to his family. 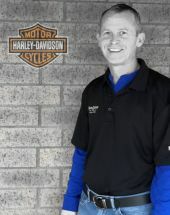 He loves being a part of the finance team and helping people find the best option to purchase their dream motorcycle. When Jeff isn't at the dealership he is playing with his grand kids, flying an air-plane (with over 20 years of experience), and fishing! Jeff loves riding his Harley any chance he gets! 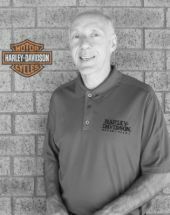 If you are in need of a new Harley-Davidson® and need help finding out how you can work it into your budget Jeff is the guy to see! Ken loves riding his Harley on the weekends! 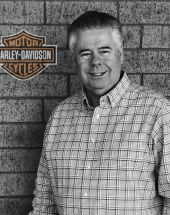 After selling Harley's for a while Ken has decided to become a Business Manager in Finance here at Harley-Davidson® of Dallas! 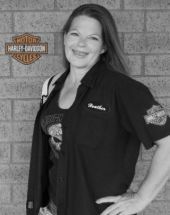 When Heather met her Harley drag-racing Husband 20+ years ago, she got more than a life partner. She was immediately hooked on riding and racing. 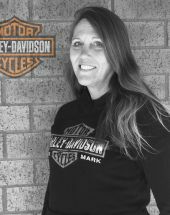 When she isn’t helping people find the Harley that’s right for them, she’s spending time with her son and family or riding around town on her VROD Night Rod Special. 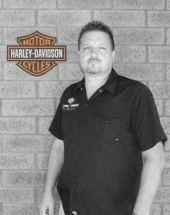 Chris is a seasoned rider who lives the Harley lifestyle daily! He loves to travel. When not traveling you can find Chris hanging out with friends and family. Chris is a veteran of HD Of Dallas! If you are looking to buy a new or used bike Chris is your guy! Come in and say hi! Mark loves fishing and hunting! When he isn't outdoors you can find him in the kitchen cooking a gourmet meal! 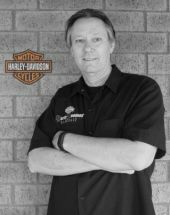 Mark has been riding for over 35 years and is an excelent Brand Ambassador for Harley-Davidson®. If you are in the market for a new bike come by and see him! 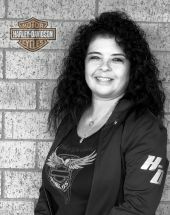 As a little girl, Kim wanted to be a Stunt Woman but the long and winding road brought her to Harley-Davidson of Dallas instead. Now, as a little grown girl, Kim wants to go where the beaches are white, the water is blue and the drinks are cold. 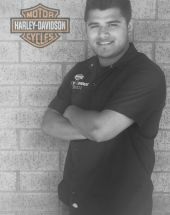 Jose has always had a passion for Harley-Davidson from riding with his father as a young boy to riding his very own 2016 Iron 833 today. When Jose is not at work eating pizza he is at home eating pizza while watching Sons of Anarchy or Game of Thrones. Rick was raised in North East Texas, he got his first Mini-Bike then he was seven years old. Rick has been in love with riding ever since. Rick's Harley is his escape & therapy. After years of hard work and stressful jobs; Rick is glad to be able to help other people find their own zen. David loves riding his Harley. Taking long trips on his FXR with his wife is probably his favorite thing to do! 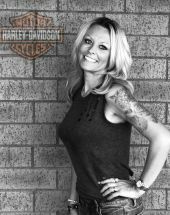 David has over 20 Years of combined Motorcycle Training, When he and his wife are home and not taking long road trips on the Harley they are at home hanging with beautiful girls! David is a proud Veteran of the Army and we are glad hes on our team! Tony is currently on his third career, and this is the favorite so far! 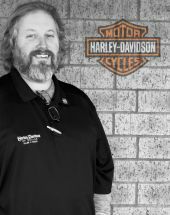 His ethos is "Everyday I get to meet the best people and talk about Harley-Davidson! And sometimes they even pay me!" As the token Brit, he can be relied on for wit, sarcasm and keeping Johnny Foreigner in check! After living in Colorado for the bulk of my life, I moved to Texas 6 years ago to start the next chapter of my life with my then fiancee; now wife. We have 4 children with an age range from 22-5. Love hanging out with our family here in Dallas & riding my 2009 Harley Street Glide every chance I get! 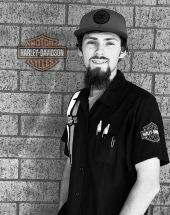 Growing up, Billy wanted nothing more than to be a dump truck driver, but instead he followed the call of his last name( Davidson) to Harley-Davidson of Dallas. A million dollars richer and Billy wouldn’t change a thing he would save the million dollars for a rainy day. The next time you're in the shop, test Billy D's knowledge of the bikes, he knows his Harley's. 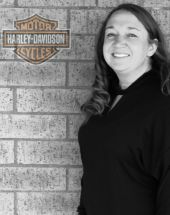 Rhonda has been on our team since March 2016 and is the owner of the one and only Vespa that has since become her favorite ride to work. Cooking and grilling out are just a few of Rhonda’s favorite hobbies so it is only fitting that the person that she wants to meet is Martha Stewart. Being a fashionista, Megann specializes in helmets and can hook you up in safety AND style. She will always encourage you to be weird, be yourself and never allow someone else make you feel worthless. Megann would love to travel the world and hang out with Lzzy Hale for a day, because that girl is such a badass - just like Megann herself. Reyleigh loves art, is a social butterfly, and has earned the title "Class Clown"! While only part time Rayleigh is a great help to out Motorclothes depart. Coming from a background of avid riders! 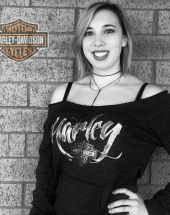 Rayleigh has been around Harley-Davidson® most of her life! Cindy loves going on weekend rides, camping, and fishing! When she isn't tackling the great outdoors you can find her at home baking extravagant cakes! Courtney is a volunteer firefighter. When she isn't putting out fires she is working on building her own bike from scratch! Courtney is a dog lover and loves her Doberman! Christian is a Senior at Boyd High School. He is a football player and has been excepted to play for ECU in the fall! Christian came to H-D Allen to learn about the business operations! Stop by and say hello next time you are in the shop! 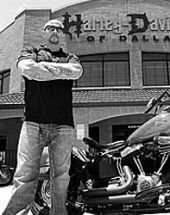 Meet the wizard behind the service curtain at Harley-Davidson of Dallas. 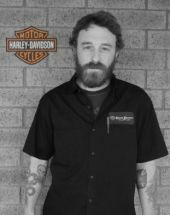 He’s been working for Harley since 2002 and developed a real passion for customizing motorcycles along the way. His ride of choice is his Softail Nightrain. In 2012, Shawn placed 7th overall in the men's Spartan Race World Series and was one of the first 10 people to be selected for the official Spartan Race Pro Team. He's traveled around the country racing but has now found a better lifestyle fit with Crossfit. And he's the shop's official Baconator - eating bacon with everything or nothing everyday. 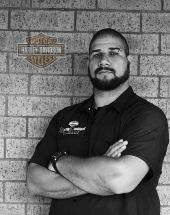 A true Texas native, Mat has been riding motorcycles since he was three years old (on his PW-50). 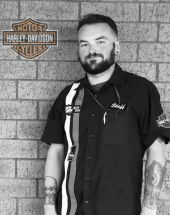 After graduating from MMI he advanced from imports to Harley’s where he has made a career for himself that supports his personal need for the thrill of the ride. 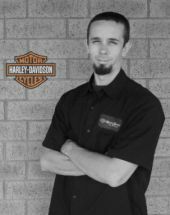 You’ll find him heading up a great deal of Service Operations at the dealership while also specializing in motor builds and Dyno Tuning. His Custom 883R is always parked on the side of the dealership during business hours and he can typically be seen pulling a stunt or two on it at the end of the night in the parking lot before getting on the road for home. 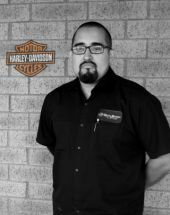 A truly skilled technician, Hatem has been with Harley-Davidson for 13 years and ee lives by the philosophy, 'If you don’t have time to do it right, you don’t have time do it twice' and his work ethic shows it. 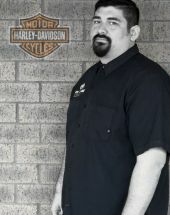 Hatem takes great pride in providing the best service on his customer’s Harleys. Outside of work, it’s all about his family, live music, skateboarding and sports. 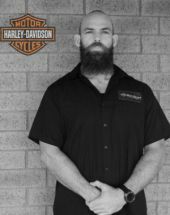 After serving two tours with the US Army, Nick was drawn to Harley-Davidson of Dallas because of the people and the environment that it brought o his life. With a million dollars Nick would give back to the disabled veterans and help as many as he could. 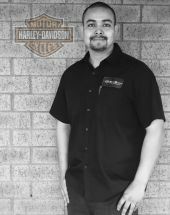 Adrian is one of three featured employees on our Harley-Davidson of Dallas Military Back T-Shirt. Adrian served in the Marine Corps for eight years. If Adrian could spend one day with anyone he would spend the day with Al Capone while watching his favorite movie Scarface. 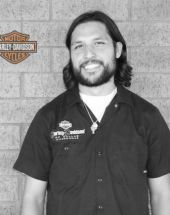 Marcus was driven to Harley-Davidson of Dallas with his desired to “own and ride the Cadillac of motorcycles.” Originally from Lubbock Marcus came to Allen with his wife, as a hard working man that could do anything he put his mind to with a desire to travel to Honduras to learn the culture. 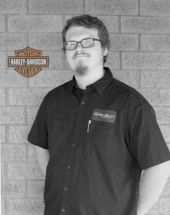 With a love for numbers Brandon grew up wanting to be an accountant, but eventually came to Harley-Davidson of Dallas instead and has been with the company over 10 years. Brandon lives the fast and furious lifestyle when making sure that nothing gets between him, his kids, Fantasy Football, and his pizza. 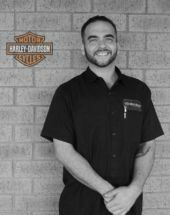 Brandon is committed to giving you the best experience at Harley-Davidson of Dallas. Another one of our lifers, Shane has been riding for over 4 decades. He’s come a long way since, the age of 6 on his 76 Honda MR50 and now enjoys his Performance Mod loaded Street Glide; no frills, all horsepower for this guy. 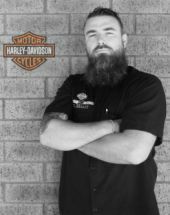 If you’re looking to increase the performance of your Harley, this is the man to talk to. When he’s not at the dealership, find him riding, hunting, or working on his muscle cars. While not exactly the most gracefully man in the shop Jeremy dreamed and still does dream of being a ninja on the side when not elegantly stuffing his face full of sushi. True to his hobbit lifestyle Jeremy would love to travel to New Zealand to meet all the little people of the Shire. Jeremy strives to provide the best service to our customers on a daily bases. Nicholas' nickname could be Motorhead... he eats, breaths and dreams mechanically. 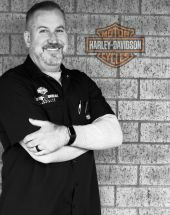 He attended MMI to work on late and early model Harley's, he owns 3 motorcycles, likes racing r/c cars and if he won $1,000,000, he would build his dream garage. 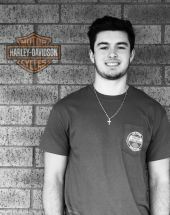 Born and raised right here in Allen, TX Derek has definitely lived up to his childhood wish by not becoming a failure when he graduated from Texas State Tech College and got a job at Harley-Davidson® of Dallas. In Derek’s free time his is achieving another lifelong goal of becoming a pinball wizard. In the words of Alice Cooper, “I ain’t evil, I’m just good lookin” are the words that David lives by on a day to day bases. On his off days, David can be seen cruising down the street on his Softail banging his head to Motorhead, playing vids or watching Ash vs. Evil Dead. Cy specializes in sarcasm and puns, but works tirelessly as one of our service technicians. In Cy’s free time he enjoys it constantly changing diapers on his kid and riding his one of a kind 1996 Road King. Marty has been with our team for a year now. He is a valued member of our service crew. 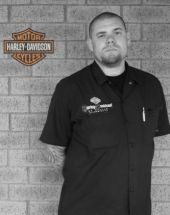 Marty went to technician school in Ft. Scott CC for their Harley-Davidson® program. When Marty is not being an exceptional Service Advisor he is home hanging with friends, playing video games, and dancing naked. Marty is a great addition to our team. Yeshua is an avid MMA fighter! He loves his family. He has a fierce passion for Harley-Davidson®. His service specialty is Warranties so if you are needing some help in that department give him a call. He is also Bilingual! Austin loves surfing and hanging on the beach. When he isn't working on Harley's he is chasing his dream of Surfing with Sharks. His ultimate goal in life is to swim with the dolphins. He collects seashells and sea horses that have been dried from the ocean. As a young child, it was Leo's dream to become a biker roaming the U.S.A. He is slowly making his dream come true on his Sportster, but with a million dollars he would ride his way to Colorado where he would buy a tiny house. Leo enjoys spending his time traveling on his bike and cooking as he is a dedicated Le Cordon Bleu Chef…next time you’re here ask him to cook you up something special. Shane makes it all happen behind the scenes! 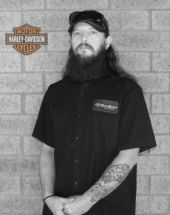 We cant wait for his calls, because it means there is a new Harley-Davidson® Motorcycle coming our way! Thanks Shane for all the hard work! Skateboarding his way through Allen as a kid, Adrian grew up with aspirations of wanting to be in a suit and tie as an accountant. When Adrian is not spending his time at Harley he is enjoying the day with his wife while eating Mexican food and watching the Walking Dead. 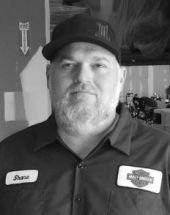 3 things to know about Jason... he knows how to customize your Harley, he rides as much and often as he can, and he loves his family. 'Nuf said. 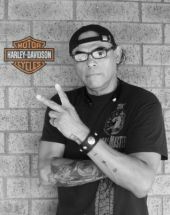 Julius has been an avid Harley® rider for many years. He rides every day! Julius has extensive knowledge about parts and accessories. When he isn't riding his Harley he is looking for ways to upgrade and increase performance. Dustin has been riding motorcycles ever since he was big enough to climb on! When he was 4 years old he knew that the motorcycle life was the life for him! He loves a good flat track race and is all about speed and fun! 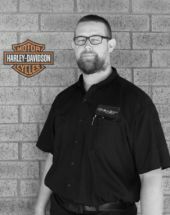 Dustin is also a certified Harley Tech so he is the man with a plan if you are needing upgrades or just guidance. Jessie just moved to Texas from Colorado. He has have been around motorcycles his entire life. Jessie started racing flat-track when he was a young kid and he still loves racing to this day. 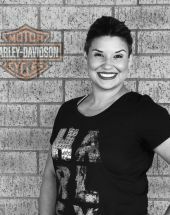 Jessie graduated mmi and was previously a Harley technician. 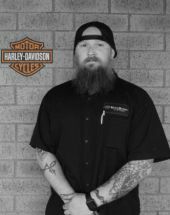 Jessie loves being outdoors, fishing, camping, riding dirt bikes, and taking rides on his Harley with his wife. 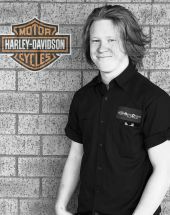 Jessie rides a variety of bikes, his flat-track bike which is a Yamaha yz450f, 2001 Dyna Super Glide and a Custom FXR! 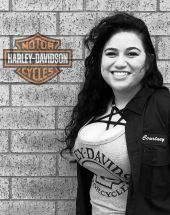 Meet our Team at Harley-Davidson® of Dallas in Allen! Our goal is to ensure our customers become a part of the Harley-Davidson® of Dallas family when they walk through our doors. We want to make sure we have met your needs in all departments including sales, parts, clothing and service. By doing this we hope to continue to earn your business to keep you happy out on the open road.